Welcome to a night of reading and boxing! Ladies and Gentleman! It is time for the MAIN EVENT! 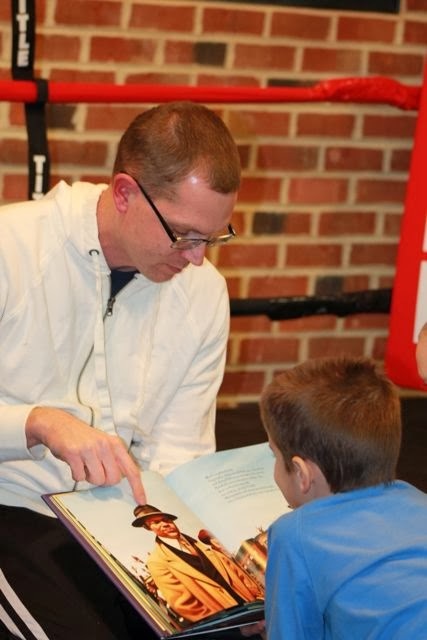 This reading experience was made possible by Title Boxing Club in Solon, Ohio! LET'S GET READY TO REEEEEEAD! This bout will be decided after reading A Nation's Hope: The Story of Boxing Legend Joe Louis by Matt de la Peña and Kadir Nelson. 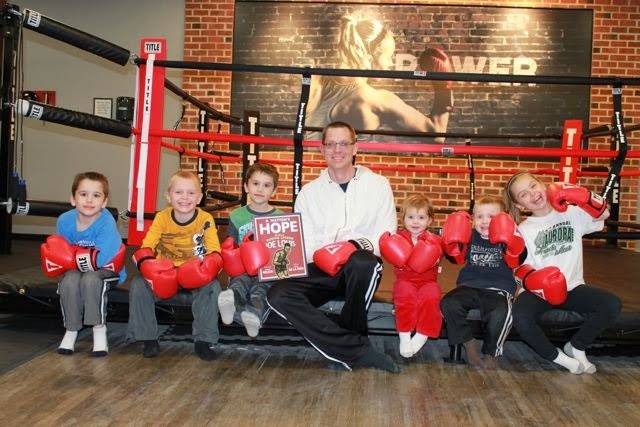 In the red corner.....a family that is new to the world of celebrating children's author and illustrator birthdays. And in the blue corner....a family that has celebrated 216 birthdays! Wow! You can just feel the energy in this place. Before the bell rings, I would like to tell you a little about how this reading experience came to be. In September, Matt de la Peña signed our copy of A Nation's Hope: The Story of Boxing Legend Joe Louis at the National Book Festival in Washington D.C. Once he shared his birthday, I knew I had less than five months to figure out a way to bring this book to life for my children. 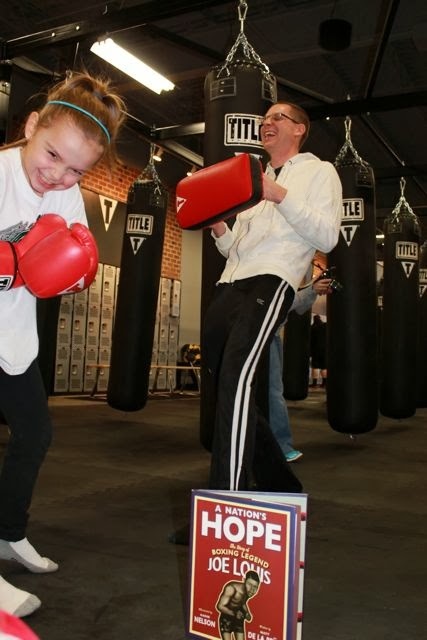 My first thought was, "It would be amazing to be able to read A Nation's Hope to my children in the center of a boxing ring." However, last fall my initial search for boxing venues within close proximity to our house came up empty. 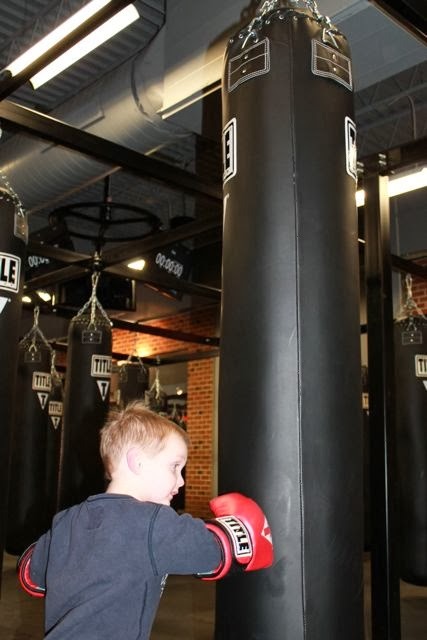 This shifted my thoughts to acquiring boxing equipment for my family to try in our home. I noticed around Christmas that boxing heavy bags were on sale, but I couldn't pull the trigger. The sale came back around in January, but I still didn't want to spend the big bucks. 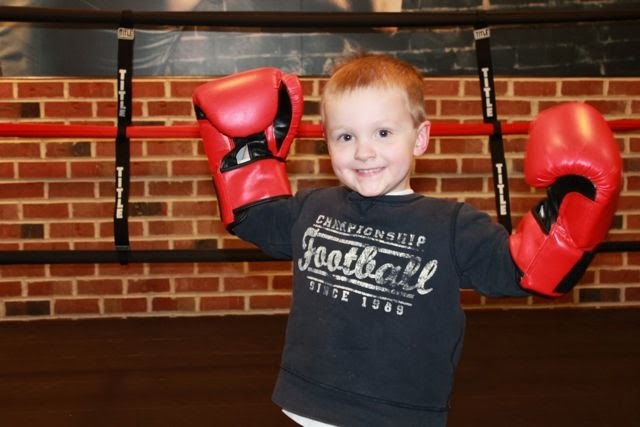 I was on my way to pick up my son from a playdate when I wondered if his friends' family had boxing equipment. After asking my friend, she said, "No. I don't think so. Wait. I think we do. Let me check into this." 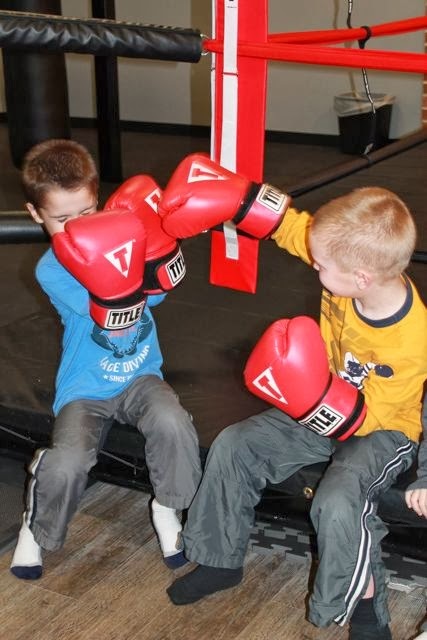 It just so happened that they had a heavy bag, gloves and a jump house we could use as a kid's boxing ring! I thanked her for offering the equipment, but I think she could sense that it wasn't exactly what I wanted. I had all but conceded that boxing in our home was as close as I was going to get for this reading experience. About a week later and I was sharing information about Happy Birthday Author with patrons at the supermarket, Earth Fare, when the same friend stopped by with her boys to say "Hi!". She said, "Did you see there is a boxing place next door?" I had no idea. 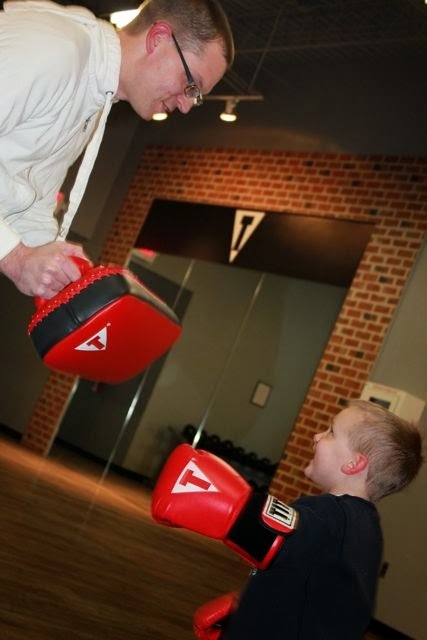 In fact, I found out that Title Boxing Club just opened about a month ago! 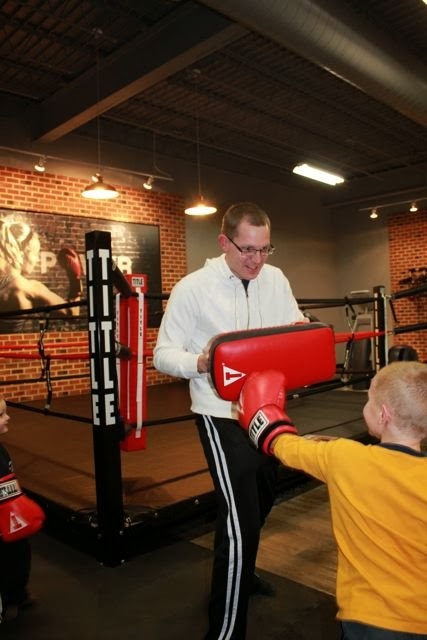 Within a few days, I went to Title Boxing Club and said, "I am looking for a boxing ring." 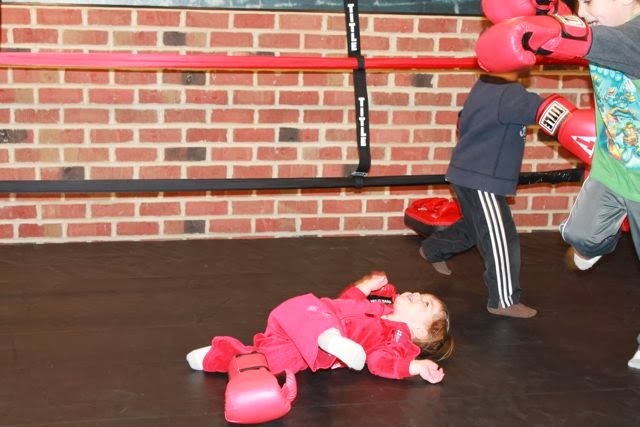 The class instructor said, "To spar in?" I said, "No. To read a book in." To make this already long story a little shorter, I met the owner and he allowed my family and our friends to stop by for what would be a VERY MEMORABLE reading experience. There appears to be a slight delay in getting this bout underway....This would be a great time to share a little bit about Matt de la Peña. Matt de la Peña is the author of many successful young adult novels including The Living, which received a 2014 Pura Belpre Author Honor award. 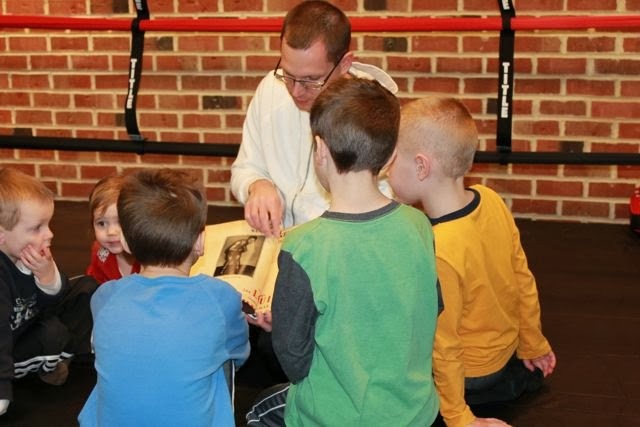 He has published one picture book to date, A Nation's Hope: The Story of Boxing Legend Joe Louis which was recognized as one of New York Times Best Illustrated Books in 2011. 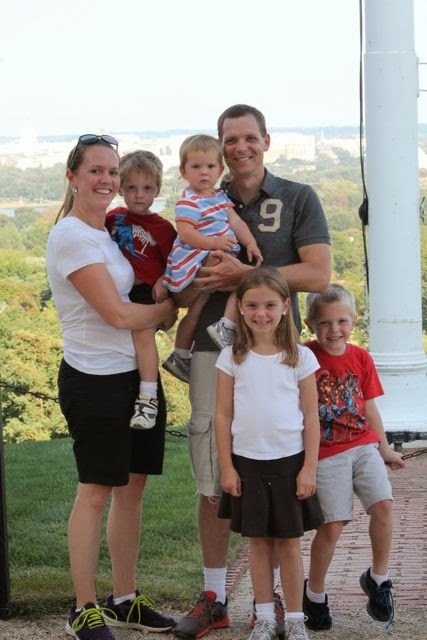 After listening to his keynote that he gave at the National Book Festival (video posted below) I learned that Matt played collegiate basketball at University of the Pacific, but realized that he was not good enough to play professionally. He enjoyed writing spoken word poetry and thought, "Maybe I could become a poet?" He joked that he only sold one poem, but has certainly found his way writing for young people. For more information about Matt de la Peña check out his website, follow him on Twitter, or watch this wonderful video from RandomHouse. Well, it looks like we are ready for this reading experience to get started....DING, DING, DING, DING! Much to my surprise, I was able to get almost everyone to sit while in the boxing ring. I started by showing them the autographs in the book of Matt de la Peña and Kadir Nelson. The beginning of the book grabbed the attention of these young readers! The book starts out at Yankee Stadium on June 22, 1938 for the "the most important match in boxing history": Joe Louis vs. Matt Schmeling. 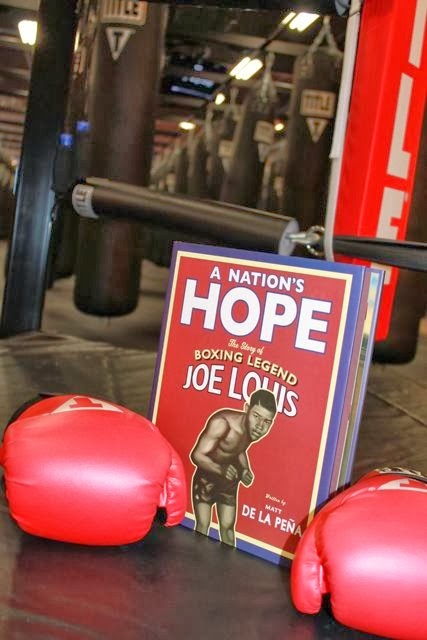 Readers of A Nation's Hope will learn about Joe Louis from his first footsteps into a boxing club to becoming an American hero. 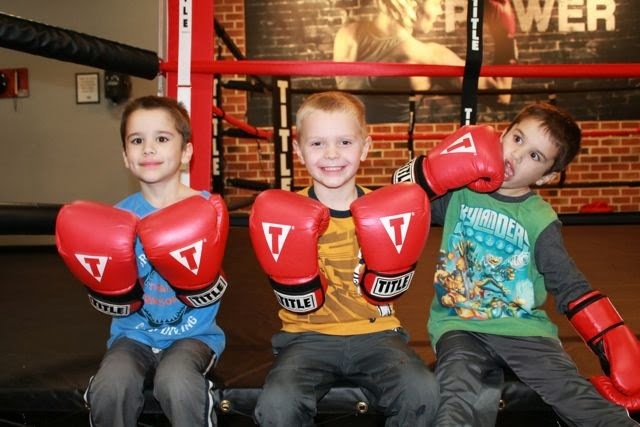 After reading, the kids were allowed to try on boxing gloves. I haven't seen my son this happy since Christmas morning! He tried to catch his buddy with his gloves down, but "his gloves never dropped an inch." These guys were ready to work hard in the gym! 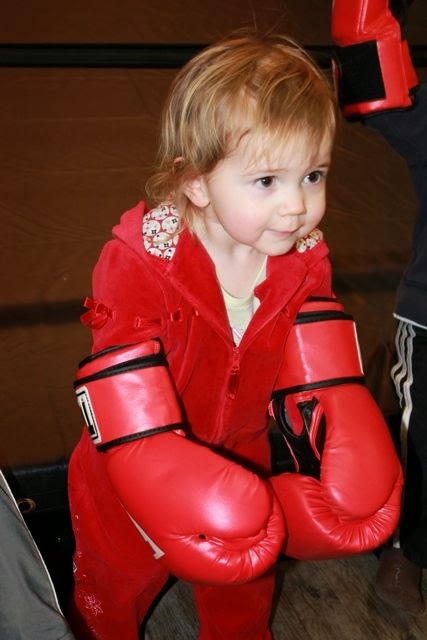 My youngest looked like Donkey Kong in her boxing gloves. A great book and good friends inspired this experience! These are our serious boxing faces! He gave his dad the old one-two! This little guy unleashed some mighty blows. My daughter learned that her hitting her dad was like hitting a brick house! Back in the ring for more action! We couldn't have read this book in a better place! She's down for the count! 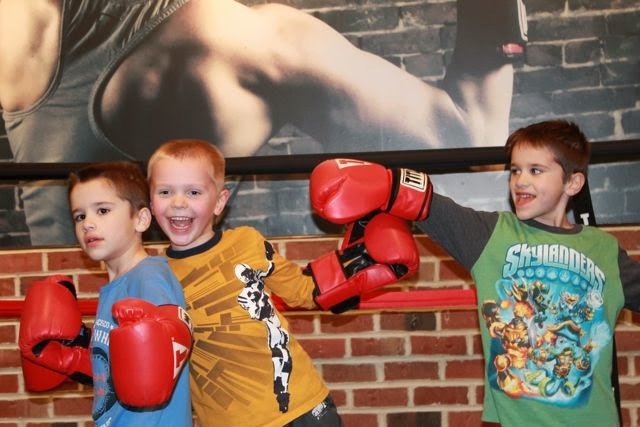 I can't thank Title Boxing Club, Solon, Ohio enough for putting smiles like these on our faces! Ladies and Gentlemen our main event has gone the distance and we must go to our judges for a decision. The winner by unanimous decision is...It's a draw! Both families are crowned champion! We had an awesome time! Thank you so much Title Boxing Club in Solon, Ohio for making it possible for me to read this book in the center of a boxing ring. Thank you to Matt de la Peña for his amazing book and for sharing his birthday with us. 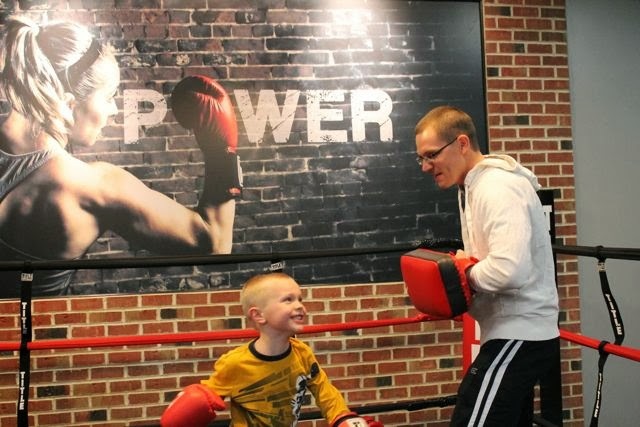 Thank you to my friend for spotting Title Boxing Club and for being interested in this experience which kept me motivated to find a way to make it happen! 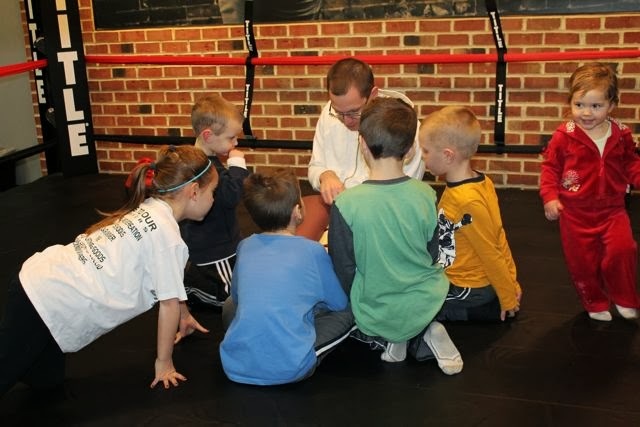 Local friends -- Please LIKE Title Boxing Club on Facebook!